A stroll down the aisles of any muskie-minded tackle shop worth its salt stirs the senses with a legion of lures built for the king of the Esox clan. Yet within this selection, one of the supple muskie softbaits reigns supreme for upping your odds of success — Muskie Innovations' Bull Dawg. Basically a soft-plastic body balanced on a stout jig-head, the Dawg may be short on shine, and unassuming compared to cranks, jerkbaits, or hair. But in the hearts of modern muskie hounds, it's second to none for producing giant fish throughout much of the season — especially for those anglers who know the nuances of making these baits perform. "It's my number-one casting bait by far," says veteran big-water guide Bret Alexander. On Lake Michigan's Green Bay and Sturgeon Bay, Alexander connects clients to mammoth muskies topping the 50-inch mark each season, some pushing past 55 with obese bellies swelling beyond 30 inches. "June, July, and August are peak Bull Dawg months," he says. "I can't give you a scientific reason; that's just when they produce the most muskies." This time-frame coincides with Alexander's focus on forage-rich near-shore vegetation, "especially the deep edges of weedbeds," he adds. "The ideal scenario is where a healthy patch of submergent vegetation such as cabbage or coontail runs along a slowly tapering bottom from 5 to 7 feet of water out to 12 to 15 feet. In a perfect world, the grass should top out about a foot below the surface." With his boat positioned over deeper water, Alexander moves parallel to the weededge, lobbing long casts inshore at a 45-degree angle to the bank. "The bait should land in about 5 feet of water, and cut a slightly crosswise arc across the bed as it moves toward the deep edge," he says. Although not as animated as some muskie baits, a Bull Dawg can be taught a few tricks. "Experimentation is key," says Alexander. "I sometimes start burning the bait back as soon as it lands. At other times, it's better to let it fall a foot or two, then begin reeling." Retrieves vary as well. Slow and mostly steady, fast and jerky, combinations of each, all of the above — and everything in between — have their place in Alexander's playlist. "Sometimes I fish it like a jerkbait, other times I make slight adjustments by reeling faster or slower," he says. "Muskies rarely favor a static retrieve. "One of the biggest tricks to working a Bull Dawg is switching rod tip angles," he adds. "I often start a retrieve with the tip pointed downward in front of me, then shift it to my right, then left. These motions impart directional changes to the bait and trigger strikes. When you're using the switch-up approach, 90 percent of your hits come when you change rod angles." Alexander also advises to never hit a potential sweet spot only once. "While it's not productive to beat a spot to death, you should always make a couple of casts over a prime area, working the bait at different depths, with different retrieves," he says. "Try the first one with the lure running high and steady, then make another deeper, for a high-low approach." If these casts fail to hookup, Alexander moves on. "Keep moving and keep trying," he encourages. "You're looking for active fish, so don't stay in one place too long." The nuts and bolts of Alexander's presentation are straightforward: stout rod, 80- to 100-pound Berkley FireLine mainline, 60- to 80-pound fluorocarbon leader. Bait selection, which hinges on conditions, is another matter. "Dark days call for dark baits, and sunny days mean bright baits," he says. "I know that flies in the face of some folks' conventional wisdom, but that's how we roll." It's worth noting that the Great Lakes muskie meccas Alexander favors are gin clear, with visibilities in the 20-foot range. Great Lakes muskie guide Bret Alexander leans on Dawgs for the bulk of his big-water casting. Another muskie sage who sings the praises of a well-placed Bull Dawg is known more for his exploits in the panfish and walleye arenas. 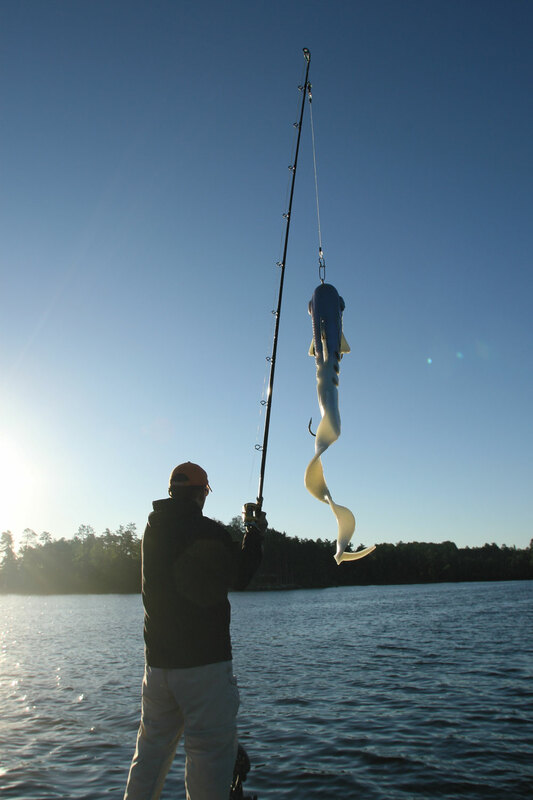 Minnesota Northwoods guide and In-Fisherman Contributor Brian "Bro" Brosdahl puts clients on pansies and 'eyes year-round, but his heart is never far from the adrenaline rush of having a big muskie explode on his bait at boatside. "I used to guide for muskies and fish for them on my own before and after guide trips. But constantly restocking my boat with gear for different species got old, so I narrowed my guiding focus somewhat," he explains. But once bitten, always a muskie fanatic. For Brosdahl, that means a lifelong affinity for Dawg shows. "A lot of the muskies on the lakes I fish — Leech, Cass, Winnie, Plantagenet — are recycled, meaning they've been caught before," he says. "That translates into a lot of follows from cautious fish. But slow-moving chunks of soft plastic like Bull Dawgs are less alarming to gun-shy muskies, so they produce more strikes." Such softbaits also shine for mimicking preferred forage species, Bro contends. "These pulsating, soft-plastic blobs are dead ringers for soft-rayed baitfish like suckers, ciscoes, whitefish, shiners, and bullheads," he says. Yes, bullheads. "Get over the spines," he chides. "When a big, toothy predator crushes a bullhead and swallows it head-first, the spines are non-factors." Indeed, in more southern muskie lakes, bullheads are common food items in the fertile weedbeds giant muskies prowl. While Alexander and many other experts employ erratic retrieves, Bro believes a subtle approach can be equally rewarding. "I like a non-jerky movement because there's something about a big, soft-plastic bait slipping seamlessly through the water that trips jaded muskies' triggers," he says. Especially in heavy weedbeds, the constant gyrations are a muskie magnet, he notes. "Some people like to jerk and glide their softbaits, but I like to pull them along slowly. The thumping, paddling locomotions get muskies' attention. Even when the bait is hidden from view by weedgrowth, its vibrations alert predators to its presence." Of course there are other tricks in this Dawg's repertoire. The addition of a Bull Dozer or other similar in-line spinner blade at the nose adds thump and flash — a boon in stained water and at night. And the mid-body blade of a HELI Dawg offers a unique look and feel, which works well on a straight retrieve or when helicoptered (hence the name) into weed pockets. Indeed, a Dawg-style softbait's appeal and uses are limited only by imagination. Not to knock flashier presentations, but this unassuming mass of jelly-like polymers is hard to beat for much of the Summer Period, when the fish of our dreams are oh, so close, but often ­frustratingly elusive.